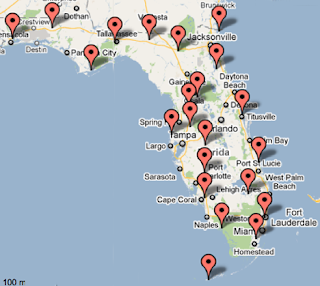 There are 22 USHCN stations in Florida, Apalachicola to Titusville, and 5 GISS stations on the list . These latter are in Miami, West Palm Beach, Orlando , Jacksonville and Tampa . 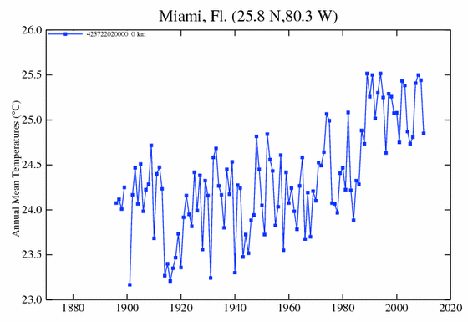 Of these West Palm Beach and Orlando have only data since 1948. 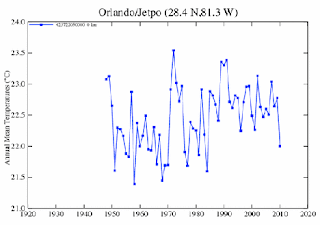 As a matter of interest I was in Jacksonville about a month ago, and talking with someone who used to have an orange orchard, but who had seen it die with the falling temperatures in winter, and the gradual movement south of the practical temperature for growing citrus crops. That is borne out by the fall in temperatures in Jacksonville. 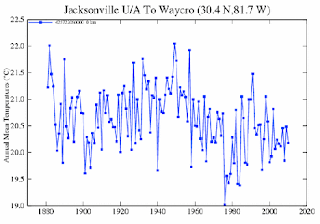 (Incidentally there have been three stations in Jacksonville, the data is from the one remaining). 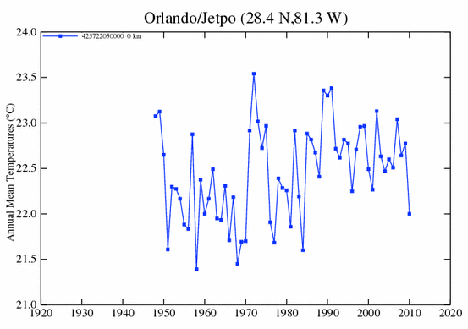 Average annual temperatures for Orlando FL (GISS) – note the truncated years. 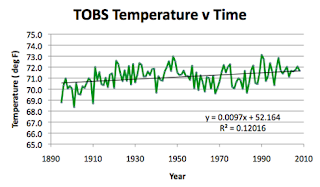 Yet when one gets down to the toe of the state, then there is an increase in temperature which has been reasonably consistent, over perhaps as long as the last century. 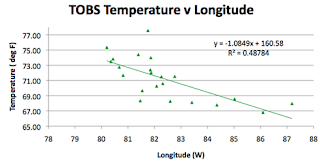 When the temperature for the state as a whole is examined, the GISS average would suggest that the temperature rose at the rate of 1.6 deg F/century. 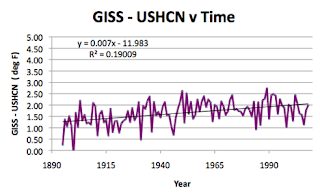 The USHCN would lower the rate to 0.89 deg F per century. 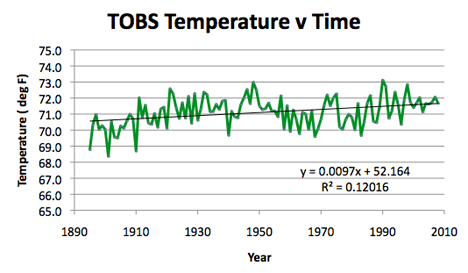 The difference between the two sets of data has been growing over that interval. 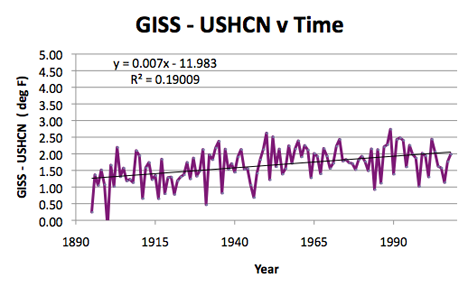 Difference between the GISS average and that of the USHCN network (homogenized data) over the last 115 years. When one uses the Time of Observation corrected raw data, the temperature rise is about 1 degree over the measured interval. 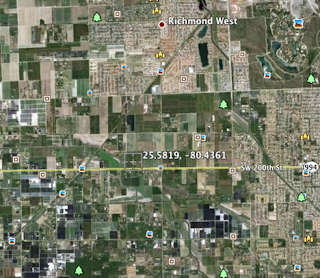 Getting the population of the different communities ran into a little difficulty at Federal Point, and I had to revert to Google Earth to find where the station was. 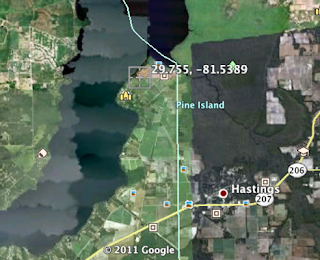 It turns out to be near St Augustine, on Pine Island, with the nearest community being Hastings, which has a population of 756. And then there is Perrine, which has an East Perrine, a West Perrine and a Kendall-Perrine. Again relying on Google Earth shows that the station is right next to the Miami Equestrian Center, just north of SW 200th St which would, I suppose make it West Perrine, though in fact it the station is closer to Richmond Heights (which has a population of 9,210). It is all part of southern Miami. 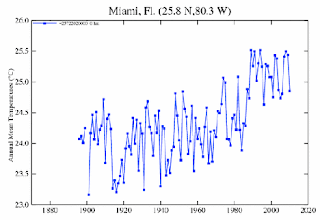 Florida is 500 miles long, and 160 miles wide, stretching from 79.8 deg W to 87.62 deg W, and from 24.5 deg N to 31 deg N. The latitude of the center of the state is at 28.13 deg N, that of the average of the GISS stations is 27.86 deg N, and for the USHCN network 28.3 deg N. The elevation of the state ranges from sea level to 105 m, with a mean of 30 m. The average for the GISS stations is 12 m, and for the USHCN stations 17 m.
Looking at the effect of these factors on the measured temperatures, that of latitude is the most obvious. 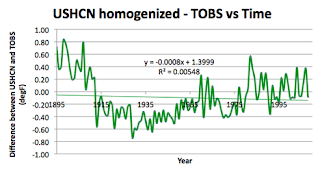 Incidentally the regression coefficient where the homogenized data is used shows a drop from 0.94 with the TOBS, to 0.89. For Longitude the correlation, for once, is better with that parameter than with elevation. 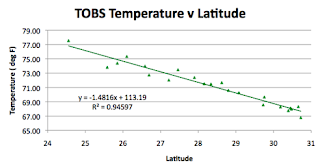 The regression is about the same for both TOBS and homogenized data, the correlation may be weakened by the number of places that are close to the shore. 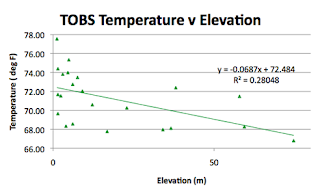 (One reason to start thinking about multiple regression plots). In terms of population, the average USHCN station is surrounded by 98,624 folk, while that of the GISS stations is 385,182, which if the correlation were with 0.6 x log(pop) would explain about 0.4 deg of the 1.66 deg average diff between the GISS and USHCN stations. 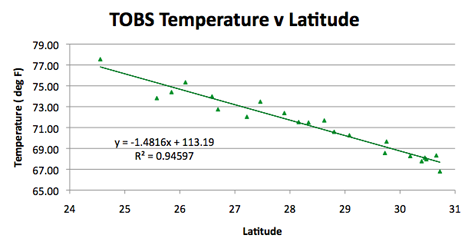 (The difference in longitude would provide another 0.5 deg). 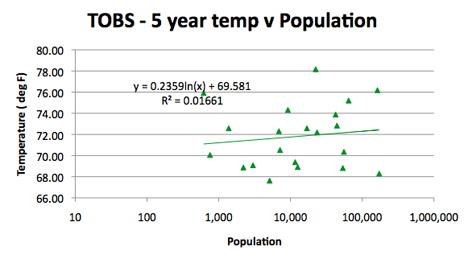 However, for the state, there is no good correlation between population and temperature. 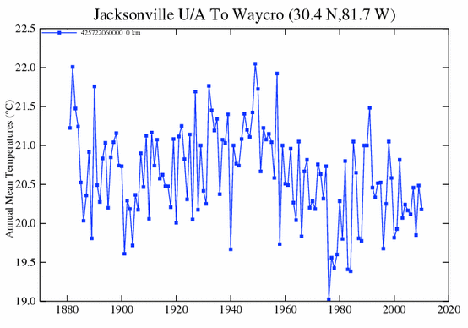 (Consider the growth of Jacksonville even as the temperature has fallen). 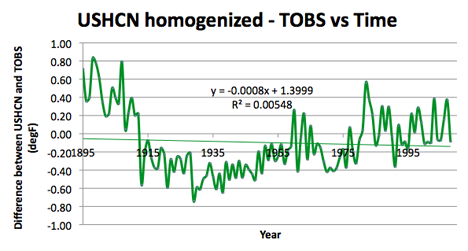 And finally the difference between the raw data and that homogenized in the USHCN series. Rather an odd shape for this state. Education Franchise At Forte School of Music, Learning Music is FUN! Learn Piano, Guitar, Singing, Saxophone, Flute, Violin, Drums and More. Book a Free Lesson Online Today!